December 31, 2011  This has been a year filled with drama and delay between President Obama and Congress, but he's ending it on a high note. December 28, 2011  The economy is expected to be the No. 1 issue in next year's presidential race. But the states holding the first primary contests are not exactly typical. In Iowa, the unemployment rate is far below the national average. Jobs in small towns, however, remain scarce. December 21, 2011  President Obama called House Speaker John Boehner Wednesday, urging him again to pass the bipartisan Senate bill allowing for a two-month extension of the payroll tax cut and long-term unemployment insurance. That the idea appears stalled in Republican-controlled House. As the Dec. 31 deadline for action nears, the White House, families and businesses are looking at the real-world consequences of congressional inaction. December 16, 2011  The Republican presidential contest remains unsettled less than three weeks before the Iowa caucuses. Nationwide, nearly one in five GOP voters is still undecided. And in Iowa, candidates are making a final push before the Jan. 3 caucuses. December 16, 2011  Newt Gingrich stood center state Thursday night in the Sioux City Convention Center. The sharpest elbows did not come from his close rivals, Mitt Romney or Ron Paul. Instead, it was Michele Bachmann who repeatedly went after Gingrich. December 15, 2011  While all eyes are on the GOP presidential contenders, there's another candidate busy building an organization in Iowa: Barack Obama. Volunteers have opened eight offices across the Hawkeye State, hosted dozens of house parties and logged tens of thousands of telephone calls. December 9, 2011  On Thursday, a bid to extend the payroll tax cut failed in the Senate, and Republicans blocked the president's nominee to head a new financial watchdog agency. But the White House is still convinced President Obama is winning the broader political argument. 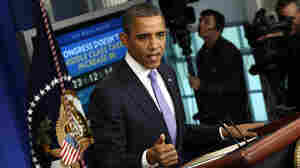 December 8, 2011  President Obama held a brief but wide-ranging news conference Thursday. He began with a brief statement criticizing Senate Republicans for blocking his nominee to head the Consumer Financial Protection Bureau. He also responded to questions talked about Iran, Plan B, a proposed extension of unemployment insurance benefits and Osama bin Laden. December 8, 2011  The Obama administration is turning up the heat on Republican Senators who've threatened to block confirmation of Richard Cordray, a former attorney general from Ohio who is the president's nominee to head a new financial watchdog agency. A Senate vote is expected Thursday. 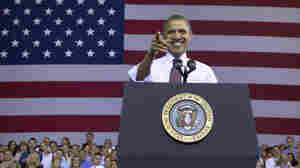 Obama Frames His Re-Election Campaign In Kan.
December 7, 2011  President Obama's speech in Osawatomie, Kan., on Tuesday laid out his vision of an active government that supports middle-class Americans. December 6, 2011  The president delivers an economic speech Tuesday in Osawatomie, Kan., where Roosevelt issued a call for a "New Nationalism" 101 years ago. The memorable phrase from Roosevelt's speech is "a square deal," which includes a distribution of wealth that benefits the whole community. Obama is hoping to sound a similar note. December 1, 2011  At a high school in Scranton, Pa., Wednesday, President Obama exhorted Republicans in Congress to extend the pay roll tax cut. He said putting money in the pockets of working people is more important than partisan politics. November 29, 2011  President Obama is ramping up his campaign for a continuation of a payroll tax cut, which only affects the first $106,000 in individual income. Republicans object, in part because they don't even consider it a tax since the money goes to the Social Security Trust Fund. Democrats see it as a progressive tax cut. "Spreading the wealth" is a theme Obama campaigned on four years ago. November 25, 2011  President Obama's campaign recently urged supporters to stock up on 2012 merchandise for the holidays. Not to be outdone, the Republican White House candidates are hawking their own ballcaps and bumper stickers. 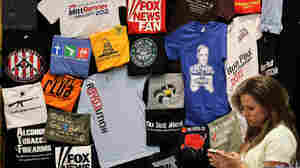 Here, an NPR guide to campaign swag. November 23, 2011  New Hampshire voters have seen plenty of the Republican presidential candidates. 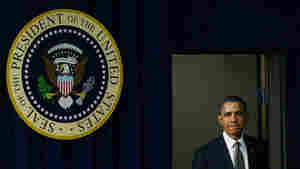 But on Tuesday, they got a visit from President Obama, who was promoting part of his jobs plan. The payroll tax cut is due to expire at the end of next month.